We had a lovely weekend last week, all suited and booted in our matching yellow coats we headed off to our much awaited Pumpkin Patch visit. We'd only picked pumpkins for the first time just last year, but it's easily one of my favourite memories of Autumn and Winter. 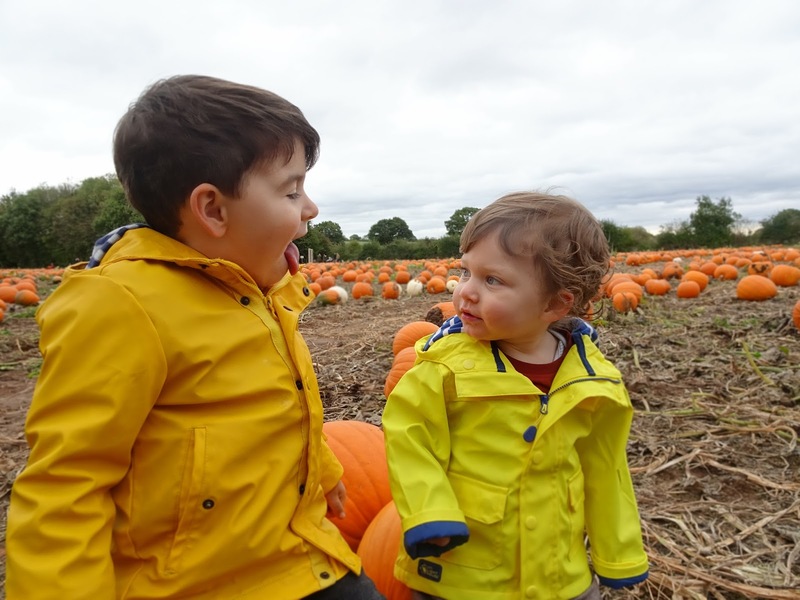 Patrick was only three months old and we'd just ploughed through a really hard September with both boys catching the dreaded chicken pox, visiting the Pumpkin farm was our first taste of the outside world in a few weeks and it felt great. This year, with two boys wanting to whizz in different directions, it was tricky at times but still just as magical. 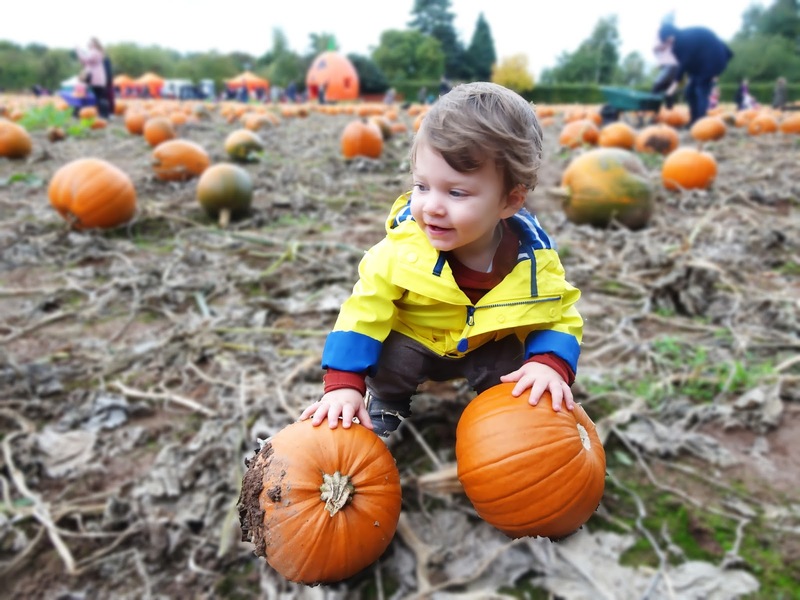 I think pumpkin picking is really going to become a 'thing' in the UK over the next few years, Halloween seems to be a bigger event every year as we take head from the other side of the pond and really start to celebrate it like the US do. Something I revel in of course, it's such a special time of year and anything that's going to help us all feel a little bit more Autumnal gets a huge thumbs up from us. Our local farm is Maxeys, it's really great for the little ones as they had so much going on, tractor rides, bouncy castles, food stalls, the whole lot, plus there is a scrummy farm shop on site that sells the most delicious cakes. Patrick loved roaming free, as we arrived on the first day the patch opened, it was pretty full with Pumpkins which proved fantastic obstacles ensuring he couldn't make a fast breakaway. Because boy does that boy love to run. When he wasn't trying to dart off to the furthest corner of the farm he was eating dirt, yes, fistfuls of the stuff. In the end I half gave up trying to stop him, settling myself with the idea that some of it probably contained remnants of vegetables. Logic, ey? Noah was the big boy this year, old enough to cart his own wheelbarrow round and hung onto that special job like his life depended on it. Which did mean we couldn't really pick up any super large Pumpkins, so perhaps another visit shall be on the cards during the month. What I loved about the farm too, was that to actually get into the patch it's completely free, meaning bloggers are in their element for free photo shoots and I did spy a lot of fancy looking cameras so I may not be alone in this thought process.